A special lucky dip perennial collection! Gives a wonderful perennial garden border. Plants featured range from Echinacea, Cornflower, Rudbeckia, Hardy Geraniums, Primulas plus many more. No need to worry about whether a plant is perennial or not - we've done the work for you. A special end of season lucky dip perennial collection. Each collection contains a mix of 12 named plants specially selected from our nursery to give you a wonderful perennial garden. No need to worry about whether a plant is perennial or not as we've done that bit for you. Our dedicated team will ensure that you get a good selection of plants which will complement each other. A brilliant way to add colour to your garden for many years to come. Plants featured range from Echinacea, Cornflower, Rudbeckia, Day Lilies, Hardy Geraniums plus many more. 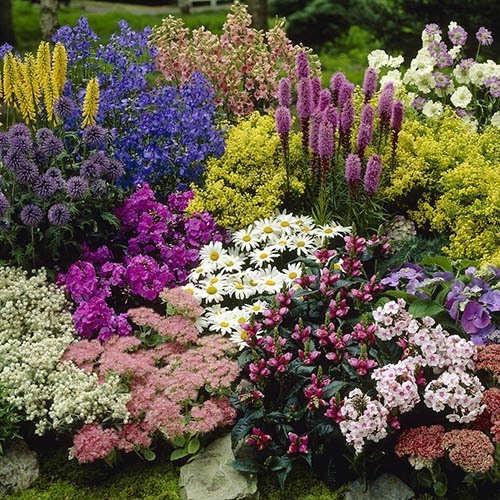 Typically, premium potted perennials such as these sell at more than £5 per pot so not only will you have enough plants to fill a good sized border but you'll be making large savings. Note: Depending on seasonal availability we reserve the right to substitute some varieites in the collection shown here.